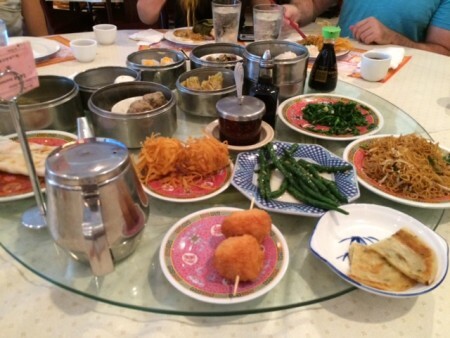 This past Saturday, I ate dim sum, and it was ridiculously awesome. I was invited to the dim sum experience with 7 other people at Lu Lu’s Restaurant in St. Louis. We sat around a round table with a giant lazy susan in the middle. Every few minutes, a server would come by the table with a big cart filled with plates of food. Our hostess would ask for a few dishes, which would be placed on the lazy susan. In no time the table was filled with a wide assortment of dishes, almost none of which we knew the names of. That’s kind of the glory of dim sum (and why it would not work at all for picky eaters): It’s a veritable cornucopia of food, and part of the fun of it is biting into something without knowing in advance what it’s going to taste like. Also, dim sum takes all the best parts of a buffet (an endless variety of food) and removes the bad parts (heat lamps, overconsumption, wasted food, the inconvenience of getting up from your seat). Words can’t really describe how endless dim sum is. It just keeps coming and coming, and you keep eating and eating. But you’re not really gorging, because everything is broken down into small portions. At one point in the middle of the onslaught of food, I looked at everyone and said, “This is the rest of our lives. We’re never leaving this table, are we?” It certainly felt that way. Dim sum. So amazing. I will be doing this again. This entry was posted on Monday, July 20th, 2015 at 12:04 am	and is filed under food, restaurants and tagged with restaurants. You can follow any responses to this entry through the RSS 2.0 feed. videux: That sounds delicious! I’ve never hard Reunionese food. It’s normal, it’s unknown to the world. An little french Island, mix of indian, pakistani, Malagasy, chinese, african, french and portuguese culture (and food culture 😀 ) (yes, that’s a lot for a small place). Yes! Lu Lu’s is the best in town! I definitely need to go back–I feel like I only sampled a small proportion of their overall offerings. Count me in when you go again!